I realized when I started to edit the chunk of math teaching history about inquiry-based and discovery methods, that I had changed my mind yet again (not unusual with such a slippery, important, and diverse subject) so it might be another few days before Part IV appears. But I've also been working on a different project for many months; as I've been writing the Singapore Math book, I've been tutoring kids in math, using the Singapore methods (since there's a heavy overlap with Common Core, there's quite a demand just now). Originally I had thought I was simply doing research and getting experience, in addition to generating a little bit of income flow, while I worked on the big project. But now I find myself thinking that long after I finish writing Singapore Math Figured Out For Parents, I still want to keep tutoring math. It's simply one of the most rewarding activities I've ever found, I'm good at it, and I want to keep doing it. (I also want to keep writing and doing various other things, fans and friends; I promise not to become a mad tutoring-addicted hermit anytime soon). So I began to figure out how to market myself as a math tutor, and a marketing campaign is like any other art form (and if your marketing people don't think marketing is an art form, fire them now. You really can't wait.) Something I learned to do in creativity classes which has served me in good stead for writing books and short stories, planning courses, designing for the stage, and yes, marketing campaigns, is to work up a longish personal statement about how I see the thing to be done, why I feel I am the one to do it, where the connections and the don't forgets and the traps and the opportunities are. Usually these stay in my desk, but as I looked at the now-almost-finished campaign plan, I thought that starting Personal Statement of Purpose was something I wouldn't mind having other people see. In fact, I thought it did a great job of explaining who I am and what I'm about, for this math tutoring gig. So here it is, formatted for the blog, modified here and there. Sometimes it talks to parents of kids with math problems, sometimes to myself, sometimes to the sort of general social audience the blog has, and every now and then I guess just to the universe. It's a bit raw here and there, but crunchy, and some of you may find it tasty. And if not, well, more math history soon. A couple think pieces about non math subjects, too. The Math Path is one of three relationships to mathematics, or pathways through mathematics, that plays out in ordinary Americans' lives. It's the good one of the three, and my aim is to put as many kids on it as I can. The kids who find the Math Path naturally and on their own typically begin in the lower grades with math being a "fun, easy subject." At some point after that they progress through math as a "challenging, interesting" subject, and later on to "this is hard, but I'll get it because I can and I want to," ending up at "wow, that's actually kind of cool," (to quote one of my tutoring students -- a third grader talking about commutativity and symmetry, though he didn't know those words yet). The Math Path is usually hard for part of the journey, and it is always long, but though they may stumble and need to get up again, or get a little ragged from fighting over the rough spots, eventually most of the Math Path kids can travel as far as they want or need to. The difficulty is just part of the trip; it doesn't throw them off forever, or destroy the pleasure they used to take in the subject, or keep them from doing what they want to do. For many people, the main reasons for wanting their kid to be on the Math Path are security and money. Obviously, kids who take the Math Path through their academic careers, and on into life, can realistically consider claiming the STEM careers that the present and foreseeable economy is so eager to offer to them. But there are much more important reasons to take the Math Path. If they do, their lives are more convenient, better informed, and more comprehensible than those of their peers. The Math Path is more convenient than the other two pathways because they know and can use the correct math in everyday situations, rather than guess at the answer and hope it works out. This is a power to solve, quickly, easily, and accurately, rather than guess, and hope. Having consulted for many small businesses and helped many friends with home projects, I know how sadly common "guess and hope" is even though all the information needed for the right answer is right there. The kids on the Math Path will have the proficiency and comfort for daily math, figuring out the best strategy for buying gas; scaling recipes, drug dosages, and home repair projects up or down; finding the length of a buried pipe without having to dig it up; estimating the effect of a bad snowstorm, a supply price rise, or a raised insurance premium on the business they own or manage; deciding the balance between points, down, and minimum payment on a mortgage or car loan. The Math Path makes better-informed citizens, who reliably recognize bogus numbers (or know how to find out if they are bogus), whether it's crime statistics, pricing packages, health claims, or thousands of other subjects we express in numbers. Math Path people confidently grasp what differences in survival and complication rates for alternate surgeries mean, whether the published statistics about a new government project mean wise investment or screaming boondoggle, and how much of what kind of benefits are likely to flow from a Social Security policy change. They're harder to fool, which means harder to frighten or exploit. Most of all, the ones who walk the Math Path simply understand the world better. The patterns that organize the real world are in mathematics; that so many people can't see them does not mean they aren't there or relevant, only that they are unseen. The annual Darwin Awards are full of people who could have saved themselves with five minutes of arithmetic; people see supernatural mysteries and even the Hand of God in situations explained by a simple equation that they can neither look up nor interpret if they do find it; people repeat generations-old wrong explanations that have more in common with associational or folk magic than with the science they could access in five minutes if they knew a bit of algebra. There's a grim parallel that fascinates me, and maybe someday I'll get a book out of that as well: innumeracy is what illiteracy would be like if it were ten times more common. It's been thoroughly established that the rate of functional illiteracy is much higher than anyone likes to think about (and very hard to determinate because people are embarrassed). Considerably more than 10% of adults can't fill out a simple form to apply for a job, order a meal in an unfamiliar restaurant, follow written directions, vote, take notes in a meeting, read an arresting officer's account and agree that it does or doesn't represent what they saw accurately, and so forth. But although there is far too much functional illiteracy, functionally illiterate people are a smallish minority in the adult population. Most adult functional illiterates have developed a set of work-arounds and tricks for dealing with a literate world—copy and pasting from the application a relative filled out for them, going only to restaurants with pictures on the menu, finding a friend to ride with them and read signs for them, and so on. Now consider functional innumerates. A functional innumerate is someone who can't correctly figure out how much change he or she will get, reliably translate any complicated numeric comparisons into what they're interested in (e.g. they don't know offhand whether five for $6 or 3 for $4.50 is the better deal), figure a tip or estimate sales tax, estimate how long it will take to drive a distance they haven't driven before, double a recipe, figure out how much a bond issue will raise his/her property tax, or buy the right amount of bathroom tile or paint the first time. I would guess that the functional innumerate population is several times the functional illiterate population; probably they are distributed much further up the social scale (if the number of people who proudly display "another day without needing algebra" on their facebook walls is any indicator). My thought is that we're living in a world where con men and crooked politicians expect to be able to use numbers to fool most of the people almost all of the time; where people lose time, money, and every other precious resource because they can't do the numbers; and where most of the scientific and technical news for adults is dumbed down as if it were being reported to third graders. A world that has a massive innumeracy problem that we cannot easily recognize because innumeracy is so common. In the next generation, if we can put more kids on the Math Path, it will be a brighter world for them, but it will be a far better world for all of us. That's what's at stake. •Road Closed is what happens to those unlucky souls who just never get math at all. For them, mathematics begins as an obscure ritual of no apparent point in kindergarten or first grade, becomes more obscure every year, and eventually becomes something to be faked if necessary and avoided if possible. If they are aware at all that math could have opened doors to them, the Road Closed people experience it as something like a magic spell they were never given. Some of them, of course, have severe cognitive problems and genuinely can't do it; but I believe, based on what I've seen as a tutor, and on the research coming out of East Asia, that many more of the Road Closed population encountered a bad mis-match between teaching style and learning style, or just weren't ready at the time the most basic ideas were presented, or accidentally acquired bad copies of foundational ideas. These are the severe cases; they can't do much of anything and they've given up. •The Refugee Trail from Eden is the busiest pathway of the three, and though it's a less severe problem, it is in some ways sadder. These are the students for whom, when they are very young, math is fun and interesting, and a source of confidence and success. But then one day it's not, and it never becomes easy again. Rather, the kids go blithely through the Garden of Easy Subject until they plow face-first into the Wall of I Don't Get It, which their often seems not even to faze their peers on the Math Path. wander haplessly in the wilderness for year or months, and finally end up squatting down and muttering "But I used to be good at math," stuck by the side of the road. Partly from a knack, partly from dedicated study of Singapore Math (which I think is the best math instruction method yet devised), partly because I've had my own struggles with math, I have learned how to rescue kids from The Refugee Trail from Eden pretty reliably; it takes months, but if kids will do some work, and the parents will support them in it, there's a good chance of catching up with the peer group, with a secure basis for continuing on at the peer group's pace, within a year or two. For the kids who are up against a genuine Road Closed, there's a much longer diagnostic process, but I've had a number of breakthroughs and seen some kids move from stuck to "just behind." Based on that experience, I'm inclined strongly to think that true dyscalculia (neurological/brain defects that make it impossible to do math) is probably rare; much more often I see kids with basic conceptual problems, which can be found (eventually) and addressed (with a certain amount of hard work). My experience with Adult Disadvantaged Learners (or ADLs, as we call them in the business) bears this out. Using Singapore Math concepts, I can usually probe until I identify where and when they hit the wall (even if the wall was in first grade), and gradually build or rebuild their pathway around/through the place where they ran into trouble, and about as soon as the fundamental wrong concept is fixed, they start to make reasonably rapid progress. The big lesson is that although I can't do much for people with severe cognitive problems, or unmodifiable laziness, the great majority of people with math problems are neither. Furthermore, with both child tutees and ADLs, the experience of discovering that a conceptual error was at the root of their problem seems to lead to not only a new confidence, but to a much better approach to learning math; they stop focusing on remember what to write in the format, and begin to seek genuine understanding. This puts them in much better shape when the inevitable next rough spot hits. Conceptual correction, using the Singapore Math methods, seems to make for much more resilient math students at any age. Fixing the concepts and pointing the student in the right direction generally seems to equip students to travel the Math Path on their own. And fundamentally, I just hate the idea of people walking around half dead and never hearing the music of the spheres. Somehow my deep faith that math is beautiful and rightfully theirs seems to be contagious over time. It seems to me like we have a thousand times saner view of music, art, sports, and so many other subjects than we do of mathematics: sure, not everyone can play in MLB, dig Mahler, or live for the next gallery opening, but we don't usually use that as a reason to deplore church softball league players, One Direction fans, or Sunday afternoon museum-walkers. Even if you're not going to go very far in math, as a human being, you ought to have a chance to understand some of it mathematically and to see what it's about. There is beauty and harmony even in the humble addition table; even the student who can go no farther deserves to see that. The people who will need, want, and buy my services are worried about their kids' being shut off from math, and not just about his/her math grades. Especially, they are also worried about the kid's emotional reaction to it; they are afraid their son or daughter may give up, losing all the good things on the Math Path before s/he can understand what that means for the rest of his/her life. They feel (accurately) that their kid could be doing so much better, that the Math Path is one they should have the chance to walk because it would reward them, not just financially but in terms of life chances, yet somehow the kid seems to be slipping off the path before even getting a fair start. Working with ADLs I've seen how deep and longlasting the traps can be. I'm fascinated by how much and how well society is able to get along without math that would make people's lives easier; astonishing numbers of people would rather fail, or be cheated, or make a mess of their jobs, or miss uncountable (by them) opportunities, rather than face the terror of mathematics. What I can bring to the aid of a math student is a really clear model of the mathematical mind, how it works ,and how it grows; a knack for questioning and observation that uncovers what the kid is thinking instead of the math we want him to be able to think about; and the knowledge and ability to use the rich and powerful Singapore Math toolbox to help the wandering kid find the real path. I had to learn how to learn mathematics very late. Oddly, I mostly learned it from economists and political scientists. I flamed out of engineering school because I couldn't do the math quickly and accurately. There were many other reasons, some of them worthy ones, but the thing that tipped the balance was that math had stopped making sense about a year and a half before. So I changed my major to economics, because a student with math abilities that are barely adequate in physics, chemistry, or engineering will send economics professors into rapturous awe. I'm not exaggerating; those guys gave out extra credit just for using calculus to solve a problem marginal rates, which, in math terms, are plain old differentials . Looking back, I had ability -- my SAT math score was 770 and a few years later my GRE math aptitude put me in the 95th percentile. It wasn't that I couldn't do math. I just didn't learn how to learn math soon enough or know the math well enough before I needed it, and that shut me out of the science I had loved since childhood. So, in my early twenties, having discovered I still had ability but wasn't at all good at using it, I started graduate school in political science in a very mathematically oriented department, and resolved to just buckle down and learn the math I needed, no matter how grim that might be in practice. Several surprisingly kind and patient teachers (I was not what you'd call an ideal, or even a pleasant, student) pushed me fairly hard in the right directions, and this time I was ready for it. The main thing they did for me was to push me back to fundamentals -- in some cases fundamentals going back to junior high school (middle school, for younger generations). Over and over, the rules and memorized algorithms that had always been how I "learned" "math" turned out to be idea-proof skins stretched over the real depths of what the math actually meant. I had been going through my mathematical life cooking numbers by recipes, like a robot; it was not till I was 23 or 24 that I began to really hear the music, start to grasp the reality, or have any kind of intuition or feel. Life took me elsewhere than where I thought I was going, but after I returned firmly to the Math Path, I kept finding my way back to math-intensive fields, in the software industry, in academic research, and half a dozen other ways. There's still damage. I can still feel the lacks and gaps induced by a background that was a mixture of too-narrow-and-algorithmic applications and too broad-and-handwavy theory with some huge outright holes, but still, math has been an enrichment and ultimately a joy in my life, and my main regret is that I didn't learn more of it. (On the other hand, I have a couple of decades left, and I still learn a few new things every year). So, my relationship to math is a bit like that of St. Augustine or C.S. Lewis to Christianity: I started off apparently well into it, lost it, and fought my way back in with far more effort than I'd really have preferred. And like those two preachers, I'd like to smooth the road for as many people after me as I can. It can be a very rough road, but the rewards at the end of it are immense: those better jobs are the very least and smallest part, compared to the better understanding of the world around us, and that too fades compared to the sheer beauty of the order that underlies everything. I wouldn't say that math is my religion (I have one that I'm quite happy with) but if I ever need a spare one, math would do just fine as a connection to the beauty, awe, order, and reason that underlies reality. I'm trying to find kids whose lives would be enriched and opened up by mathematics, who are unable to access the math that can take them up into the perception, understanding, and beauty. And after a rather surprising amount of experience, considering I didn't start out to get it, I've been forced to realize I have a knack for guiding the lost people out of the dark traps of confusion and up into the light of comprehension. It's a worthwhile job, and I like it. Every kid I can break out of the disappointing, frustrating trap that claimed a large part of my life is another claim that I have done something worthwhile with my life. Unfortunately, kids don't have much money and would be curiously reluctant to spend it on math if they did. Luckily, many of them have parents who do have money, want them to have full access to the power of math, and notice when that isn't happening. A mixed blessing in the whole stew is that I'm fairly good at explaining the benefits and goals of developing real math ability (as opposed to purely coaching math-test-passing skills). This means not getting quite as many clients as I would like, since there are commercial tutoring services out there that offer moneyback guarantees of percentage increases or absolute scores. To be able to guarantee it, they sometimes meet those goals by teaching math, but if necessary they'll concentrate on test-taking skills, drilling short answers, and various other substitutes for math. What I offer to do, and I'm blunt about this with parents, is to get their kids through the present block, equip them to knock down future blocks themselves, and most of all learn math, because math is a profoundly important human activity in which every child has a right to participate. If you just want twenty more points on a test score so you can brag about who's taking your tuition checks, we probably won't work out. If you want your kid to know math, and maybe have a chance to love it, get in touch. This isn't so much a checklist of symptoms or warning signs; it is a list of what parents (whose children went on to succeed) experienced in the weeks or months before they brought a kid in for me. If any of these seem to be true for you, you might want to think about it. Kid has been drilled heavily but can't remember math facts in a usable way; on homework or in class, if the kid is presented with exactly the same problem a few minutes apart, s/he does not recognize it and has to solve it all over again. Kid seems to start all problems at very basic level (counting on fingers, reciting rules out loud, etc.) and does not seem to be moving away from this. Kid applies rules arbitrarily (cross multiplies fractions regardless of the problem, chooses numbers apparently at random out of a story problem and does some simple operation on them). Executive function problems -- kid can do one step but can't break a problem into pieces and do the pieces in the correct order. Kid has and follows some inexplicable wrong rules all his/her own (for example, I dealt with one boy who had separate rules for adding and multiplying digits that formed closed loops -- that is, he had one set of rules for 1, 2,3, 5, 7 and another set for 6, 8, 9; and which way he tried to add or multiply 4 depended on whether it was written with an open or closed top). Kid appears to think that you or his teacher could just decide that his/her answers were correct, but you won't because you're mean. If any of that sounds like you and your kid, maybe I can help. I'm confident that if it's a matter of finding a way over, around, or through the conceptual barriers, there's almost always a tool in the Singapore Math toolbox, and after my months of working with it, I know where those tools are and how to use them. Those might be all the benefits you need, and certainly they are the ones I'm most comfortable claiming. Other benefits might also flow from this, though they can't be guaranteed for all cases. I generally give parents at least a quick oral summary at the end of every session, and make sure you're well-equipped to help your kid with homework (at the elementary school level; if your kid is having trouble in calculus I won't make you learn it yourself!) Parents have reported that this has made math coaching into much more pleasant family time, and much less of a battle. Moreover, once your kid really knows what s/he does understand, and what s/he doesn't, anxiety tends to decrease because the kid stops feeling like s/he has to fake it, and because in their self-image, "I don't know it yet" replaces "I'm so dumb." It has happened, now and then, that math goes from terror and anxiety to a favorite subject, but of course that's very individual and I can't promise it to everyone. Finally, its about helping your kids claim their human birthright to experience math as a bridge, not a barrier. Just like reading and writing, becoming good at math gives your kid a pathway, that Math Path again, to real independence, whether it's academically (being able to pursue a subject for love rather than because it's easy), perceptively (having the tools to see how a snowflake, a sine wave, or a star are the way they are), or economically. Oh, yes, of course. No matter how much I downplay it, a parent can hardly be unaware that math is the gateway to science, and science is one gateway to medicine, engineering, and great jobs. So, if you've got a problem like what I'm talking about, and you want your kid to walk the Math Path, drop me a note at the email that appears in the menu to the right. Give me a way to contact you and I'll be back to you ASAP. Another one of those story-thus-fars that regular readers can skip. I'm working on a book called Singapore Math Figured Out ForParents. Singapore Math is the system of math teaching used in that small nation since 1981, in most of the top-performing-in-international-comparison Asian nations, and increasingly in many other countries. For about ten years it's leaking slowly into the United States via charter schools (especially for the gifted), homeschoolers, and some of the "college academy" schools that aim at increasing the college enrollment and success of low-income, first generation, and people of color. Singapore Math has been partially included in the Common Core standards, and many public school systems are considering moving to it as a way to meet those standards. Singapore math is genuinely better than other ways ofteaching math, but it absolutely requires teachers who really know what they're doing, which requires them to be adequately prepared and trained, which, historically, the United States has screwed up nearly every chance it got. So my guess is that my country is going to miss its best chance to become better at math, and this point in history is a spectacularly bad time to do that. As part of Singapore Math Figured Out for Parents, I've had to study a great deal of the history of math instruction, especially in the U.S. The main track of the book will be about how parents can make Singapore Math work out for their kids, but for a variety of reasons it seems like a good idea to have a section about how we got into this mess in the first place. And so I've been blogging that history, about one sizable chunk per week. I began with the problems with traditional proceduralism (the "basics" that most "back to basics" want to get back to), which mainly involve a tradeoff: to achieve early computational proficiency (kids who are fast at basic arithmetic in grades 1-4), procedures are taught in a way that causes most people, later on, to run into a wall (that "horrible thing that math was easy up until" that is part of so many people's childhood misery in math -- the moment when it all stopped making sense, whether that moment was long division, fractions, decimals, or basic algebra, to cite the four most common). After that I looked at the JohnDewey-inspired "pragmatic" or "math for everyday use"approach, which essentially avoids the wall by going so slowly and staying so tied to very simple problems that most students never go far enough to hit it. And so here we are at the most infamous of all math curriculum changes: the New Math. New Math: the first try to fix math instead of avoiding it. In the whole history of mathematics education in the USA, probably nothing began with more promise and higher hopes, or ended in more dismal results, than the School Mathematics Study Group's curriculum, known forever to everyone as New Math. In 1957, the Soviet Union orbited the first artificial earth satellite, Sputnik, beating the United States into orbit by what turned out to be almost four months. At the time, because the possibilities of artificial earth satellites had been covered heavily in the press, most American politicians, reporters, and educated people knew that a rocket big enough to orbit a 183-pound satellite was big enough to deliver an atom bomb anywhere in the world. After that, events seemed to conspire with the Soviets to make it all extra-humiliating for the Americans. Sputnik-1, at 83 kg, went up in early October 1957, and Sputnik-2, at 500 kg (half a ton), went up a month later. Then in December, Vanguard, the first American attempt to launch a satellite (accurately described by Khruschev as "about the size of a grapefruit"), collapsed and exploded, having attained all of four feet toward orbit. Finally, on January 31, 1958, a hastily cobbled-together and restarted Army program managed to send up the American Explorer I, which was roughly the size and shape of a fencepost, weighing in at 13 kg (or about thirty pounds). So in a space of about four months, the Soviets showed that they were there first -- twice before we even got one to blow up on the ground -- and all of it much bigger and more impressive. For years before the "Sputnik crisis" (as Eisenhower himself called it) in America's technological self-confidence, college mathematics professors had grumbled about the poor preparation of entering freshmen. Hard to imagine as it is today, the closest thing there was then to a "national curriculum" was the bestseller list of some of the largest textbook publishers (out of hundreds of textbook publishers, and even the biggest were nothing like the Big Three of today). A few schools of education at some state universities suggested curricula; most did not. From school district to school district, what was taught, in what order, with what rationale, and with what quality of instruction varied immensely. A few kids from high schools like Bronx Science arrived at college at sixteen, already having completed a year of very theory-heavy calculus. Many more kids from Speedtrap, West Dakota, might only have had the option of three years repeating Practical Math (a common course at the time: a review of common arithmetic word problems) because there was never enough interest to put together an algebra or geometry class. Furthermore, many instructional materials were frankly terrible. A retiring math teacher who needed to supplement a pension could self-publish a hastily-written summary of his or her lesson plans and call it a math textbook, which his or her old school district would then adopt. Math instructors at small colleges, often just former star students with only a BA from the same college, published similar textbooks via the small commercial publishers (whose sales people frequently bribed them into school districts with donations to athletic teams or price breaks on cleaning supplies). Many of these textbook authors had never been particularly good at math, and were simply repeating or plagiarizing the work of similar predecessors, often with new errors in each generation of copying-without-comprehension. Furthermore, the World War II-Cold War frantic demand for engineers and technicians of all kinds guaranteed that anyone with decent math chops could usually make more (and find more interesting work) in industry than in public schools, so those confusing not-quite-right textbooks were often being explained by hastily re-allocated gym or home ec teachers. 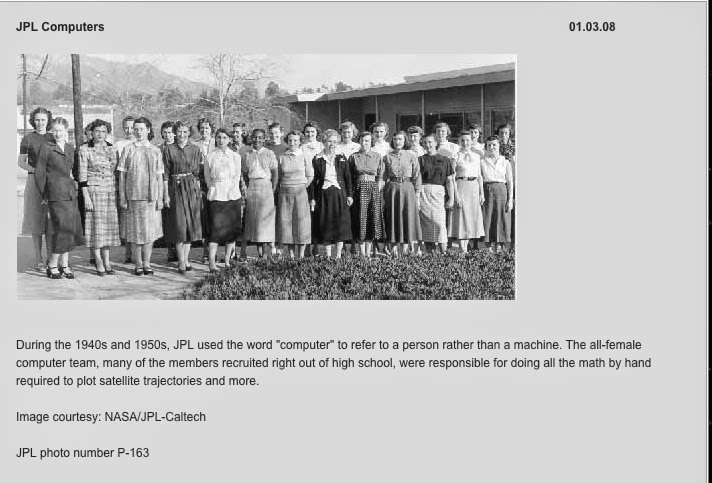 And in Denise Kiernan's The Girls of Atomic City you can meet some of the computers who helped design the atomic bomb. (Along with many other women doing many other things at Oak Ridge during the war). So we had plenty of good "computers" and some of them were finding their way into college math classes. But a relatively small number of people had ever even been taught the concepts of real mathematics. To most people, including most mathematics teachers, math was carrying out those patterned manipulations you'd use to run Eb's General Store, just like in 1910, except that fifty years of Deweyan pragmatism had eliminated most of the difficult patterns. Even in the relatively few (by today's standards) secondary schools that taught appropriately advanced mathematics, learning was impaired by math instructors who didn't know math very well teaching from textbooks by people who knew very little more. Many of them were teaching ideas that were not true, patterns of reasoning that were not valid, rules that didn't always work, and in short a load of mathematical nonsense that students would have to unlearn in college. It would have been difficult to pretend that no one knew before Sputnik. Critical activists, most importantly the National Council of Teachers of Mathematics, but also the main university mathematician organizations, had been screaming from the late 1940s on. Moreover, even before Sputnik, the public was having a pretty thoroughgoing reaction against Deweyan pragmatism. The method of teaching reading then known as look-say was taking a well-deserved beating in the conservative press and in books like Flesch's Why Johnny Can't Read (1955). I simply stared. "Why, I'll graduate from high school, Dad. That'll get me into college." "So it will. Into our State University, or the State Aggie, or State Normal. But, Kip, do you know that they are flunking out 40 per cent of each freshman class?" "Perhaps not. But you will if you tackle any serious subject—engineering, or science, or pre-med. You would, that is to say, if your preparation were based on this." He waved a hand at the curriculum. I felt shocked. "Why, Dad, Center is a swell school." I remembered things they had told us in P.T.A. Auxiliary. "It's run along the latest, most scientific lines, approved by psychologists, and-"
"-and paying excellent salaries," he interrupted, "for a staff highly trained in modern pedagogy. Study projects emphasize practical human problems to orient the child in democratic social living, to fit him for the vital, meaningful tests of adult life in our complex modern culture. Excuse me, son; I've talked with Mr. Hanley. Mr. Hanley is sincere—and to achieve these noble purposes we are spending more per student than is any other state save California and New York." "Well . . .what's wrong with that?" I didn't answer. He went on, "Why did Van Buren fail of re-election? How do you extract the cube root of eighty-seven?" Van Buren had been a president; that was all I remembered. But I could answer the other one. "If you want a cube root, you look in a table in the back of the book." It was a very open secret: in math instruction, and in many other subjects, the 1950s was the heyday of emphasizing socializing the kids at the expense of dumbing down, when in many states a single "health" class (don't pick your zits, puberty is normal, eat the food pyramid) was being counted as the mandatory "science" for a high school diploma. It was, after all, the era when boys in Detroit referred to lifelong employment at GM as "thirteenth grade," and when social promotion from grade to grade had become the norm because, well, why not? Suddenly, we'd been beaten out of the gate in the race to the next frontier. Suddenly, the country of Edison, Westinghouse, and Oppenheimer, had been skunked by the country of steam tractors and cheap suits. All at once, the people who had been complaining about the Deweyan pragmatic reduction of school to a day camp for future housewives and assembly-line workers (because "you could get a job with that") had a much bigger audience. The quiet of 30s, 40s, and 50s in math education was exposed as the silence of the empty chicken coop, where rocket-propelled commie chickens now roared in to roost. Teenagers in the tech-labor-force pipeline were unprepared or underprepared. It was painfully clear to millions of Americans that they couldn't trust the math teachers to teach math. Worse yet, what was being taught was usually watered down and sometimes actually wrong. Where could America turn for the math whizzes to beat those Russians right now? Strangely enough, we had a large share of the world's math talent; we just weren't doing much in K-12 to develop more of it. For generations, the university mathematicians had been mostly ignoring what was going on in the schools, except to arrange private tutoring or secure one of the few good high schools for their own kids, and to complain about the incoming freshmen who appeared never to have seen an x in an equation before. Now, in the post-Sputnik panic, a small group of public-spirited and civic-minded, genuinely excellent university mathematicians organized themselves into the School Mathematics Study Group (SMSG). In the urgency of the moment, with money flying out of Washington and the state capitals, they secured National Science Foundation funding to tackle the problem: what should the K-12 math curriculum look like? Because what followed was a disaster, and history is re-written by the culpable, it's important to avoid swallowing all the myths whole. New Math did not come from nowhere and it was not an obviously bad idea; it was an emergency attempt to deal with a perceived gigantic problem, and before it was tried, there were many good reasons to think it could and would work. In those consensus-on-the-Cold-War days, the New Math had the political fingerprints of everyone from the deepest conservatives to the most blazing liberals all over it. Far from creating New Math or conspiring to foist it on the public, the educational establishment and its attendant bureaucracy (like any establishment or bureaucracy confronted by a demand for immediate radical change) hunkered down to resist it, actively or passively. Though individual teachers out in the schools tried to make New Math work (and sometimes succeeded), New Math was crammed down the choking and gagging throats of the mostly non-teaching educators in the teacher's unions and the schools of education, who resented and feared the loss of control over a major area of school curriculum. Furthermore, New Math was not concocted by eggheaded theory addicts for the greater glorification of theory. The SMSG sought to prepare students for some of the best jobs then available, at least white male middle-class students. (In the climate of the time, a claim that women, non-whites, or poor people had "special needs" would have been regarded as a thinly veiled statement that they couldn't hack it, and as a basis for discrimination.) The objective was to replace a curriculum that did not prepare people for science, engineering, and high-level technical work with one that thoroughly prepared them. Later, after New Math had crashed and burned, some conservative politicians and some teachers' organization leaders would try to paint the pre-New Math era as one of idyllic contentment in which the kids just quietly learned their math. Then, their story ran, (conservative version) evil teachers unions and (teachers union version) wicked ivory tower mathematicians, in cahoots with the brutal text book industry (both versions, and they did have a point) set out to destroy American mathematics, and using their eerie totalitarian powers of mind control, seized control of mathematics in America and destroyed it. That tale wasn't true. Again, math instruction had been deteriorating for decades before Sputnik triggered the formation of the SMSG. Again, right and left, labor and business, everyone from the hippest beat to the grayest square in a gray flannel suit had been complicit as math programs decayed for decades before Sputnik, and supported the New Math at it inception. The most prominent opposition group before New Math was adopted was actually the "professional educator" bureaucracy, who felt quite correctly that they had been denied a seat at the table. Moreover, the SMSG actively sought practicality; that was the whole reason to introduce a far more rigorous math curriculum, reversing decades of dumbing down. The story that New Math was a bunch of ivory tower educrats replacing real math with a bunch of theoretical nonsense is a bogus rationalization formulated long after the fact, mainly to support fundraising in conservative parent groups and to justify the counterrevolution of the classroom teachers and their professional leadership. Unfortunately, though an ill-advised alliance of emotional supporters of traditional proceduralism and self-interested supporters of Deweyan pragmatism were the people who carried out the counter-revolution against New Math, the obstinate fact is that New Math was a disaster, and it really did have to be scrapped. The energy to get rid of it may have been supplied by Sister Mary Hick'ry Stick and Curriculum Director Homer "Get a job" Simpson, but it had to go anyway. The crash that followed the SMSG's optimistic and well-meaning start had many causes. First of all, the professional educators did have a major point: almost no classroom teachers and no educational psychologists at all were involved in the curriculum design. Given the state of American math education at the time, that probably seemed like a good thing, a kind of spiteful spurning of a profession which had done so badly for so long. But commitment to a set of bad ideas does not necessarily mean that people are ignorant of everything important, and commitment to do better does not create needed information out of nowhere. The SMSG had no one to tell them that first and second graders do not really have a sense that things could have gone differently than they have, so it makes little sense to try to teach them probability. There was no voice to point out that most kids don't really see how a proof can be true in abstract, or grasp the distinction between valid and true, until they are about ten or eleven. Rather than using known, well-established information about average children in ordinary schools, the SMSG seems to have drawn on a small population of former children who were in command of advanced concepts at a very young age -- that is, themselves, kids who grew up to be mathematicians. So, based on their own experiences as bored prodigies having their time wasted in dumb-to-them classes, the mathematicians naturally preferred theoretical rigor and ignored developmental appropriateness, and there was no one to point this out. If the cardinality of the set of stools=2 and is restricted to integers, how do we define the location that is between two stools? It also didn't help that much of the American mathematics community was pretty far toward the systematization pole in the eternal cycle between pioneering and systematization. In the long history of math stretching back through several different cultures and many millennia, some mathematicians (like Galois, Cantor, Riemann, Noether, or Godel) have always been subversive pioneers, finding the problems and issues that no one else had looked at and proposing solutions to them. Other mathematicians (like Euclid, al-Kharizmi, Newton, Gauss, or Hilbert) have been systematizers, who construct the proofs and build the chains of logic that tame those frontiers and regularize them into orderly branches of mathematics. Mathematics needs both, and most research mathematicians are themselves a mixture of pioneer and systematizer. But at different times, places, or branches of mathematics one or the other tendency will be dominant. To use everyone's favorite metaphor, it's a pendulum: systematizers lock things down into rigid structures. Pioneers begin to look at the foundations and discover incompleteness and weaknesses, eventually undermining or transforming the structure. That creates work for the systematizers who build it up again, better and more complete before. In the late 1950s, American mathematics was passing from a long generation of capable, brilliant systematizers into a younger generation of iconoclastic pioneers. Many senior mathematicians had spent most of their working lives in an environment where math research tried to resolve questions with proofs and to pave simple, clear, straightforward roads into the wild country that the mathematicians of 1850-1910 had opened up. The systematizers' dream of having a definitive list of axioms and rules of proof, from which all of mathematics could be constructed in one vast derivation, seemed closer to possible then than it has at any time since. Although Whitehead and Russell had failed at one of the most ambitious attempts to unify all math in a common set of axioms, and Kurt Godel and Alan Turing had shown that it could never be done completely, the vision lingered on in older mathematicians that somehow, one day, there would be a list of axioms, and a very long single proof ending with "QED Math!" At the same time, there were a host of marvelous cracks and odd spots in the foundations of traditional mathematics. Whole new branches and subjects like game theory and discrete mathematics were opening up, and fields that had been moribund for decades like computation and number theory were moving again. Younger mathematicians were finding immense, fruitful new areas to work in. It was an exciting time in math research, with the frontiers advancing in many directions all at once. a rigorous structure in which math would be built up from fundamental axioms, via logic, into complex deep concepts, thus ensuring that mathematically talented students would arrive into university classrooms with a deep understanding of the basis of math itself. a mind-broadening freewheeling experience of the many exciting faces of modern mathematics, of how much there was yet to be discovered just for the sheer joy of knowing it, and applied to sciences and human affairs in ways not yet dreamt of. They weren't thinking very much about whether either of these approaches would work for a student of average ability trying to learn from a teacher who didn't understand it very well, assisted by parents who didn't see any particular need for either perfect logical rigor or the discovery of more esoteric math, especially not when they mainly expected their kids to learn to "put down two, carry the one." Furthermore, because mathematicians are unsurprisingly drawn from kids who were good at math and had little trouble with it in early grades, the SMSG was made up of people with a deep disdain for drill. They had mostly been that seven-year-old who had the multiplication table in two days. That had been painfully frustrating when teachers kept drilling it for three months, chanting out "two times ... three times ... four times ... " That was, after all, the curriculum around the time of World War I, when senior mathematicians of the 1950s were in grade school. Back then, no matter how much the seven-year-old mathematicians-to-be really wanted to ask about the main diagonal forming the set of perfect squares, or some rudimentary idea of prime numbers, they quickly learned not to ask about it; classroom order was still being enforced with paddles and dunce stools. So the math professor of 1958 learned to survive, in 1918, by plodding through the drills, but he didn't learn to like it. By the end of the second grade, most of them still loved math, hated math class because it was all drill, and probably despised the inept classmates and teacher who forced the drill on them. Forty years later, trying to figure out an elementary school math curriculum, they thought a great deal about how dull that drill was for that talented kid. And they weren't about to invite some second-grade teacher or educational psychologist into the room to explain what drill did for the average kid (whether the average kid liked it or was aware of it or not). So on one level, New Math was designed to be what the top 10% of the students in every math class had always wished math class would be. Which was great if you were in that top 10% -- and so was your teacher. For everyone else, it was a worse version of what had been going on for a long time: the teacher didn't know much math and many kids didn't acquire much of what s/he did know. But that was only the first stool. On another level, New Math was also supposed to get kids excited about all that great math they could learn, or would be learning shortly, in all those hot new fields. It was rather like being trapped in a room with a pack of math nerds, all of whom are anxious to tell you why their math is the coolest math there is. That's a tough enough experience for an evaluator from the National Science Foundation, let alone for a third-grader. At the very basic level, the branches of mathematics seem far apart and as if they have little to do with each other. At the high end, everything you can say in mathematical logic you can say in set theory, which is why set theory is a powerful tool designing computer algorithms; at the low end, one is about whether or not Socrates is mortal and the other is about overlapping circles. A first-grader can handle a little bit of rudimentary set theory, logic, arithmetic, number theory, and geometry, but what a first-grader can handle just doesn't overlap enough to make deep connections. So instead, teachers and students tended to concentrate on whatever was easiest to understand at that grade level. First-graders took time off from addition facts to learn geometric definitions that they might not use again for a year or more; fourth graders escaped from long division to talk about functions; everyone started every year with set theory because, although it has few applications at the most basic level, it's relatively simple. Naturally this reinforced the student tendency to learn math "in the moment" or "in the unit," only remembering what they need to do the work in class today. Young students often like the pretty patterns and rhythms but seldom see why they might want to remember it; "learning math" is a possibly fun activity for now, not a cumulative process leading into the future. That's a large part of why traditional proceduralism sends kids into the wall: the patterns are fun, so they learn the patterns and are rewarded for it, but no one insists that they also get the ideas that they will need. Then one day they run out of pattern and need an idea -- and don't even know what one is. New Math managed to make that process even more devastating to young math students than traditional proceduralism had been. Those long breaks to visit "other cool math" were interrupting the already-difficult process of building math up from basic bedrock concepts to advanced conceptual structures tied together with cables and beams of logic and proof. Either the goal of building math like a mathematician from unifying concepts or the goal of giving the students mathematical breadth by introducing them to many different fields would have been hard enough by itself. Trying to do both of them at once would probably have failed with the best mathematics teachers in the world. What no one did: Retrain or replace most of the teachers in the lower grades, at a large cost, and begin New Math with the incoming first, second, and third graders, working your way upward into the higher grades as you obtained more teachers who really understood it. It would also have helped to supply supplementary material and sessions to explain things to parents so that they could stay involved and learn along with their children. This would have cost a great deal, but probably would have worked as well as anything could, given the damage already caused by split focus and developmental mistakes. What the SMSG recommended: since the hard way was clearly out of the question, the SMSG suggested that school districts should begin by introducing New Math via high school advanced classes, where bright students could quickly catch up on the pieces they were missing, and where teachers tended to be more mathematically proficient, so that retraining would be easier and quicker. This would allow time to introduce New Math into teacher training curricula in the teacher's colleges. Then the schools could gradually spread the concepts downward (from Grades 10-12 through junior high, middle grades, and primary grads) and outward (from advanced to standard academic to general and remedial classes) as older teachers retired and better-prepared ones moved in. This meant a more or less constant retraining budget for about ten years, working down from 12 to K, giving the maximum time to the less math-oriented lower grade teachers (and allowing some graduates to come back around the cycle and enter the system in elementary education). The estimate was that in about ten years the whole school system could be converted to the new way, with most of the (large) expense falling in years 4-7 of the process. What they actually did: For just the cost of replacing the textbooks (and remember, that's money for kickbacks and new football uniforms), hand all the teachers at all levels the new textbooks in the last couple weeks of summer break and tell them to look these over and try to stay a chapter ahead of the students. If any teacher absolutely insists, send them to one of the cheap or free SMSG summer math seminars, from which they can return either as confused wet blankets, or as unpopular know-it-alls, either way helping to ensure nobody else would want to go (and ask for travel money) the next year. With all those forces taken all together, New Math would have been doomed even if it had been a genuinely great way to teach math. But even if we could have willingly afforded double-Ph.D. math/Ed.D. child psych students in every classroom from first grade on, the primary problem with New Math is that although seeing how all of mathematics hangs together is central to a mathematician's understanding of math -- and often seems to be the moment when they really realize that they are mathematicians and that mathematics is what they want to do with their time -- it isn't the way in which most people who need to get math get it. The developmental path for nearly everyone is drastically different from the path of formal logical exposition that mathematicians mostly build for themselves in retrospect. That last point is important enough to elaborate a little: most mathematicians themselves learned basic math by a developmental path, that is, one that introduced concepts and ideas in long-form, slow ways that a kid's mind can grasp, and gradually introduced more advanced concepts first as abbreviated or short-hand versions of the basic ones, and then as extensions to them. Later, the extensions become a quick, clear explanation and take the place of the developmental experience. For example, developmentally, most people naturally learn addition as "counting on": you have three pieces of candy, someone gives you two more, and you first learn that to "add" the three and the two, you start at three, and then count two more: 1. "four", 2. "five." Since counting on always gives the same correct result no matter what you're counting, be it galaxies or bumblebees, you memorize "addition facts" so that you don't have to spend all your time counting. Then you extend further to learn that among the countable things are numbers themselves: three tens and two tens make five tens, but we can abbreviate that as 3x10+2X10=50, and so on through multiplication. Now, if you're a mathematician, one day, when you are starting to see that the way addition grows out of multiplication, and exponentiation out of multiplication, is something much more subtle and powerful than just "grouping" or "repeating," you are ready to learn to talk about all of them as related operations which form a closed group on the integers. The mathematician quite possibly went over that same road, though further than you did. But looking back, with fully developed mathematical eyes, s/he sees a completely different definition of addition, one that has nothing to do with counting. It will begin with a definition of the integers (the union of the set of whole numbers and their additive inverses) and then give five brief equations (the first one is n+0=n) which can be chained together to define the solution of any addition of integers no matter how complicated, and finish by noting that the group of integers is closed under addition (meaning if you add two integers, you always get another integer). To a professional mathematician, a computer scientist, and sometimes to a physicist or chemist, that sets-operations-groups definition of addition is actually more useful than the plain-old ordinary regular one. Indeed, it's useful to the mathematician or the computer scientist to think of the sets-operations-groups definition as the thing that you use to confirm that the everyday, developmental one works for all the possible integers. But it is not necessarily best for a first grader to try to start out with sets, operations, or groups. Intuition about what numbers are and what they mean is vital for the first few years of mathematics, particularly for learning to see the world mathematically, and intuition, or "number sense," develops out of correctly interpreted specific and simple experiences. Why "sadly"? Because there was a baby in that bathwater: the real understanding that leads to using math for clearer thinking, better jobs, and ultimately a more successful life does matter. In places where the New Math was implemented well and properly, there was in fact a bumper crop of well-prepared students who went off to great success in college and life. If they hit the wall at all, they hit it later, more gently, and with more resources for getting past it. The concepts to get around in theory-land, and to understand how and why to go in and out of it, are genuinely essential. As breathtakingly poor as the pedagogy of New Math was, the content was in fact just what the doctor would have ordered, if he hadn't been a quack. Unfortunately, the first real medicine that showed up was so unpalatable, and so poorly thought out, that it was virtually impossible to get it into anyone. That disastrous lost generation also highlights a few other lessons for anyone seeking to improve math instruction: first of all, that parents are going to make it or break it, for reasons that make sense to the parent. If the parent doesn't know what this is about, or how to help their kid with it, there's going to be a revolt, not soon, but right now. If there's no resource for the parent to turn to, all those problems are going to be much greater. Secondly, individual classroom teachers are going to be a mixed blessing for any kind of math reform; the ones who are eager to learn and use it will be the reason it succeeds, but not every teacher is going to want to do that, and during the transition, there will be teachers telling the children that "this stuff in the book doesn't make any sense" and urging parents to complain about it. If parents know what the program's about, and agree with it, the resistant teacher can't do much damage; if they don't, well, that's what killed the New Math. Finally, the New Math saw the first "indignation entrepreneurs" -- people who began to make a living, and sometimes quite a good one, by organizing against a curriculum. They weren't major players in the 1970s as the New Math was being abandoned, because the movement was so large and diverse already that it didn't need much more recruitment or leadership. But the discovery that parental anxiety and dislike of schools was a potential source of money, votes, and indirectly of prestige and power was not lost; it would play an increasing role in both the advocacy and the defeat of every reform (and every counter-reform) from then on. Speaking of which, in the next few weeks I'll take up several of those. Next up is what is variously known as discovery or "inquiry-based" math, which, like New Math, demonstrates that the same idea can be foolishly and unfairly maligned at exactly the same moment when it is also being wisely limited or even justly rejected. And for those of you who are really not into math teaching, I have some hopes of having something nonmathematical up later this week.